Funny, this pizza was so good I actually made it twice. 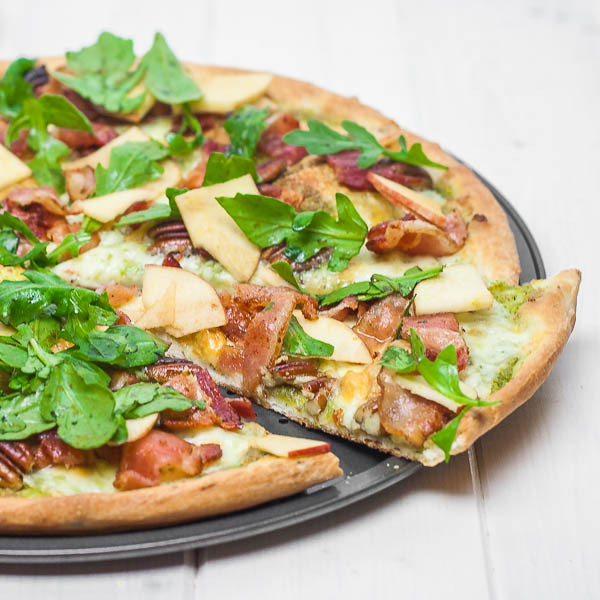 Now check this out, apples, arugula and bacon, pretty much I said everything that there was. Well, actually you need a sauce or something as a base and this is why I used pesto, kinda made sense but as you already know, pizza is a versatile dish, you can pretty much use whatever you think might work. Start with my good old recipe that I always use whenever I make pizza and have some pesto ready as well. Spread pesto and a generous amount of mozzarella on the dough then bake it in a preheated oven at 500° F / 260° C, for 10-15 minutes. The rest of ingredients are added after the dough is done but you can read about every step in the preparation instructions, no point in writing about it twice. In my first attempt I chopped everything very small pieces and julienned those apples and it was good but I was left somewhat “unfulfilled” so my next pizza was pretty loaded. 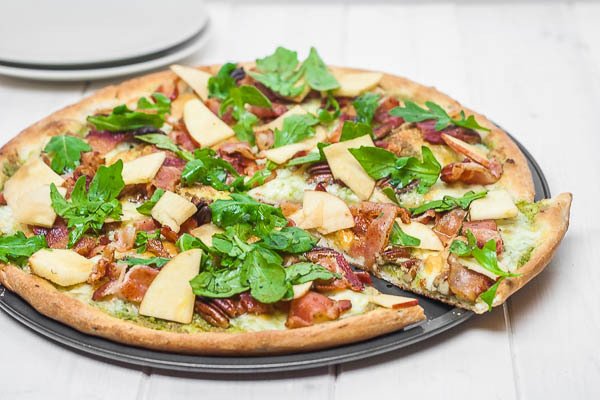 Another important bit is the bacon, I fried it separately because I did not want my pizza to get all oily, I wanted to lock the fresh sensation that you get from apples and arugula. I also used pistachios instead of pecans but it is up to you, both work just fine. Here I used the same recipe but I used a bit more of everything, apples are cut differently, pecans are halves instead of chopped and bacon… there is loads of it. What’s not to love! If you cut your apples somewhat in advance, make sure you spray them with some lemon juice so they don’t get brown and weird. Enjoy! As usually, start by making the pizza dough. Feel free to use this recipe, it is awesome. Spread a thin layer of pesto and continue with lots of mozzarella. At this point you could use some mushrooms as well then bake in a preheated oven at 500° F / 260° C, for 10-15 minutes. Fry bacon in a skillet and use paper towels to get rid of extra grease. In a bowl, mix arugula along with balsamic vinegar and pepper. 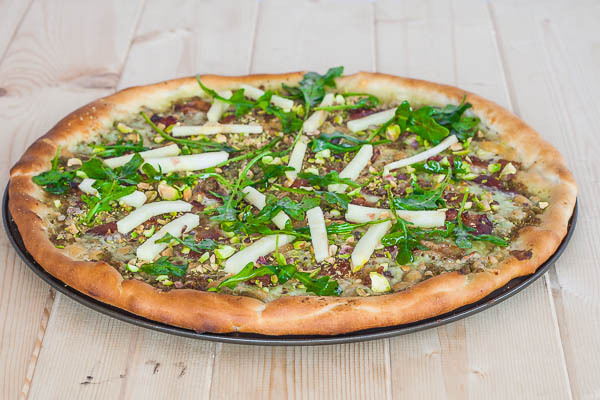 After dough is baked add all the other toppings, arugula,bacon, apples, pecans and pepper to taste. No salt required.